We've all been neighbors so long, so very, very close. Your sun-stained straw huts, they're standing yet. Heading where, what path—I have no idea. You've wrapped up your belongings, even the broken bowls, that leaky pot. Now where are you set on going? —yes, I remember them well. They paid off their debt of sorrow with life's hopes, hunger, and exhaustion. Standing here I watched it all—it seems like just the other day. "You won't stay any longer? Which way are you headed? I suppose there's greater peace somewhere else—more hope? A deeper sense of life, I guess? And that's why you'll go there to build your huts of hope. But, no matter where you go, life itself does not change. A tale of pain and separation shall show itself in graying hair." So said that ashvattha tree, trembling in the darkness overhead. তোমরা যেতেছো চ'লে পাই নাকো টের! দাঁড়ায়ে-দাঁড়ায়ে সব দেখেছি যে,—মনে হয় যেন সেই দিন! 'এখানে তোমরা তবু থাকিবে না? যাবে চ'লে তবে কোন পথে? সেই পথে আরো শান্তি—আরো বুঝি সাধ? আরো বুঝি জীবনের গভীর আস্বাদ? বলিল অশ্বত্থ সেই/"Said That Ashvattha Tree," published in Kavita, September, 1936; included in The World at Large. 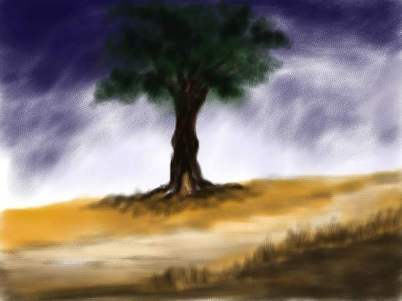 Besides the tree in the title, the nim (neem) and jamrul are likewise trees. Illustrated by Nilanjana Basu. Nilanjana has been illustrating regularly for Parabaas. She is curently based in California.